Location: County Hall building, Waterloo, London, UK. 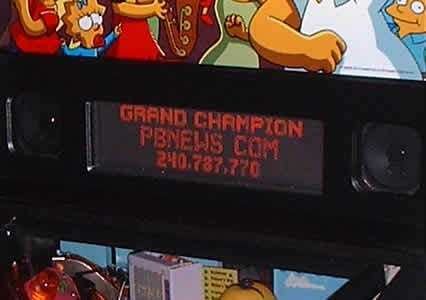 Pinball News is not given to hyperbole. The reviews you'll find on this website are considered and avoid the hype and over-exuberance you may see elsewhere. Well, just for once, let's throw all that out of the window and celebrate the spectacle that is London. Why? Because the site we're looking at here is in the midst of some of Britain's greatest tourist attractions and you can't avoid seeing them if you're going to the Namco Station on the south bank of the Thames. 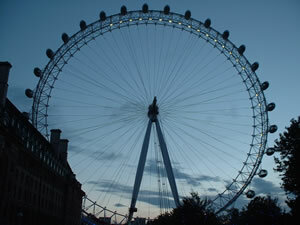 If you take any of the conventional routes to the Namco Station you will walk around a corner and find yourself staring in awe at the London Eye. It's impossible to convey the scale and magnificence of this structure but I defy anyone to stand it its shadow and not be overawed by the brilliance of the design and construction. To the left of the Eye is the County Hall building, the former seat of power for London's council, but now housing a variety of attractions such as the Saatchi Gallery, the London Aquarium, several eateries and bars and the Namco Station. Across The Thames is the small matter of the Houses of Parliament, and of course probably the most famous clock in the world, Big Ben. 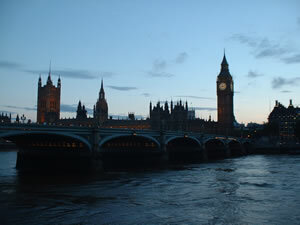 (Actually Big Ben is one of the bells but the tower is generally known by the same name). The architectural extravagance of the Parliament buildings takes your breath away, and even then you're only looking at the facade. 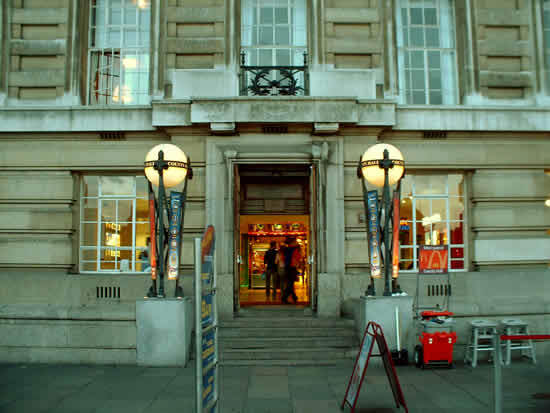 But back across the river and through the doors of the County Hall building, past the McDonalds on the right and we're into the Namco Station; a large arcade featuring examples of just about every kind of amusement game. Despite its size, there is only one pinball game, and to find that you have to descend to the basement into the sports bar which I think has a lower age limit of 18. 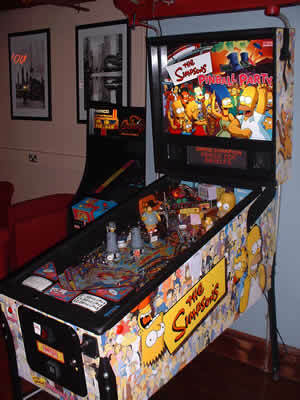 However, once you get there you'll find this Stern Simpsons Pinball Party game. It's also positioned quite near the bar, so it's handy for refreshments, but not too close that the area is crowded. The game is obviously quite new and almost everything works OK, the only exception being the Kwik-E-Mart loop. It registers if shot in the reverse direction but not normal way, from the skill shot for example. The game also has some rather unusual settings. It is probably set to "easy" or "extra easy" because the clock starts off at 45 instead of the more usual 30 and the TV mode and Springfield Elementary shots are always lit and only need relighting once they've all been completed and you've played Alien Invasion and Springfield Mystery Spot respectively. The high scores weren't living up to their name with the Grand Champion only 60M points but, with these easy settings and the UK All Skill posts enabled, it was an easy task to rectify the situation. There were no credits for getting any of the high scores, but with games costing the usual 50p and the replay level set to a base of 6M points, it was easy to keep playing for very little money. The bar itself as a very limited range of drinks available and is really aimed at the 18-30 market with lots of fizzy lager and alchopops but little else, but then that is probably the target audience of the Namco Station itself, and judging by the clientele on this evening they're hitting the mark.